A 20-month-old boy enjoying a healthful snack. For years, parents have had a tough time determining what’s best to feed their infants and toddlers. That’s because much of the nutrition information that’s readily available was intended for infants under 6 months and children ages 2 years and up. These guidelines are intended to complement and expand—not replace—early-feeding recommendations from the American Academy of Pediatrics, Centers for Disease Control and Prevention, and other expert groups. The new guidelines provide practical and useful recommendations based on scientifically sound evidence that should help parents establish healthy eating patterns during their children’s infancy and toddlerhood. Guideline topics include coping with food allergies and sensitivities, how to feed infants and develop children’s self-feeding skills, and the importance of physical activity. Butte, along with William Heird, also a professor of pediatrics at Baylor and CNRC, were part of the panel of leading pediatric experts who developed the new guidelines. Members agreed that the growing problem of childhood obesity and research showing that inappropriate foods are entering children’s diets at earlier ages than expected make it clear that healthcare providers need a better foundation for making infant and toddler feeding recommendations. They also need better tools for communicating the importance of healthy eating habits in early childhood. In August 2004, Gerber—among the world’s best-known baby food companies—launched a campaign for pediatric nutrition called “Start Healthy” to raise awareness in new parents. 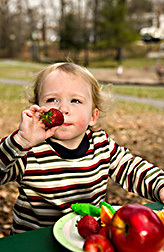 The “Start Healthy” website (www.gerber.com/starthealthy) provides content from the expert panel, including a comprehensive brochure with tips and information on feeding young children. The panel’s final recommendations are in the form of answers to specific research questions, such as: What foods should be avoided to reduce food allergy risk? How do infants and toddlers communicate hunger and fullness? When and how quickly should solid foods be introduced? How can parents create a healthy eating relationship? The guidelines were published in the March 2004 issue of the Journal of the American Dietetic Association.—By Alfredo Flores, Agricultural Research Service Information Staff. Nancy F. Butte and William C. Heird are with the USDA-ARS Children’s Nutrition Research Center, 1100 Bates St., Houston, TX 77030; phone (713) 798-7179 [Butte], (713) 798-7177 [Heird], fax (713) 798-7000. "Knowing What’s Best for Baby To Eat" was published in the June 2005 issue of Agricultural Research magazine.